Can dogs eat grapes or raisins? Can dogs eat raw chicken? Dog car sickness or dog anxiety? Dog Teeth Cleaning without anesthesia: Is it better? How to prevent dog’s bad breath? How to treat dog’s car anxiety? How to teach a dog to lay down? How to teach a dog to sit? We have experience to drive a car to take your dog out, whether to the park or to the veterinary clinic. But significant numbers of people worry about it, because as soon as some dogs climb on the car, they will vomit; Some dogs become destructive and noisy, and bark unusually; Even some dogs suddenly jump out of the car. When you think of dog’s bad performance, you certainly don’t want to take the dog out. You may not know why dogs behave the way they do. In fact, most dogs are not car sickness but anxiety. It’s easy to distinguish between the two, dogs with car sickness are relaxed but anxious dogs are extremely uneasy. To your dog, when they are outdoors in car, dogs would not feel happy because of the curious. Dogs are in a small closed space which has terrible noise like engine sound, and makes them feelunstable. A blast of the honk noise would give dogs a startle. People and buildings outside the window appear and disappear suddenly, many dogs never saw all of these. Under such circumstances, surely dogs feel uncomfortable both on the body and the mind, and you may even start blaming your dogs. Dogs would remember these bad experiences, and perform worse next time. 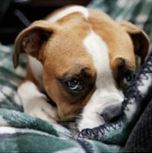 Dog anxiety often causes laxitas of sphincter, and makes them defecate and urinate in the car. Don’t scold the dog as the dog is unintentional, and would lead to greater anxiety. Now remember, adding dogs anxiety would make it rather difficult to guide dog’s behavior in the future. When dogs were little puppies, it’s important to give them an enjoyable experience in car. If you have an adult dog, you just need more love and patience to face this problem, also can help your dog to relax in car. Can dogs eat brussel sprouts? Can dogs eat sunflower seeds? Can dogs eat the mango?